After the public debacle of 2014’s satirically ambitious festive offering The Interview, Seth Rogen stars in a far more conventional Christmas film. Reteaming Rogen with director Jonathan Levine and co-star Joseph Gordon-Levitt, who all worked on cancer drama 50/50, The Night Before allows Rogen to fall back on his familiar stoner routine to comfortable, if hardly game-changing, effect. 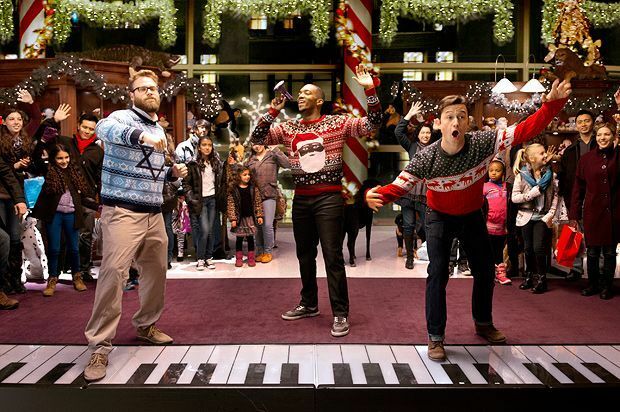 The Night Before heavily recalls Superbad (which was co-written by Rogen with writing partner Evan Goldberg, who contributes to the screenplay here) but, instead of a trio of juveniles seeking their first adult party, Levine’s film is about three adults hitting the streets of New York in a chaotic quest for the decidedly elusive, ultimate Christmas bash, The Nutcracker Ball. Each man nurses dark motivations for their desire to get wasted: Ethan (Gordon-Levitt) mourns his parents, Isaac (Rogen) fears fatherhood, and Chris (Anthony Mackie) has problems with his current sporting fame. The set-piece comedy of The Night Before leads them to tangle with all forms of local adversity, notably the consistently sinister Michael Shannon as a shady drug dealer. Obvious pop culture references abound, from Die Hard to Kanye West, and celebrity cameos from Miley Cyrus and James Franco do little to give The Night Before an identity of its own. But, as with 50/50, Rogen’s crew have a stronger suit to play as they capture the lazy camaraderie of guy relationships, and how such male bonding can serve as a sticking plaster over personal hurt. Levine’s film works better as a blackly funny character comedy than a seasonal variety show, with top-billed Gordon-Levitt’s warm persona grounding the increasingly manic shenanigans in some kind of realism. While never a classic in the manner of the Christmas movies it references, The Night Before cheerfully rehashes Superbad’s freewheeling bonhomie to provide both crude silliness and predictable bromance in holiday-season-sized portions. General release from Fri 4 Dec.